This is a great album - it's not their heaviest but it's a perfect introduction to the band if you haven't listened to Blackberry smoke before. Existing fans are likely to love this album. Well worth checking out. 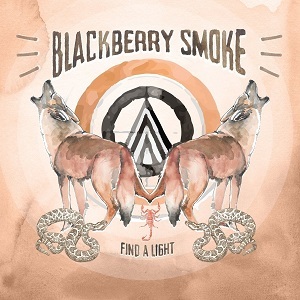 Find a light is the sixth studio album from Blackberry smoke. I had to double check that when I first read it – it doesnt seem long since The Whippoorwill was released and that was their third album, but incredibly it’s been six years. Blackberry smoke haven’t just been busy writing, recording and releasing albums though, they’re a band that is constantly on tour. I’m not sure how they’ve found the time but they’ve also raised almost $200,000 for children’s cancer research – so they’re not just good musicians, they’re good people too. For this album they’ve brought in a few guests – Robert Randolph (“I’ll Keep Ramblin'”), Amanda Shires (“Let Me Down Easy”) and The Wood Brothers (“Mother Mountain”). A few years ago there seemed to be an explosion of Southern rock, but now the dust has settled and some of the bands have disappeared back into obscurity, Blackberry smoke are one of the bands still going strong, and judging by this album, they’re going from strength to strength. Part of the reason for that is that while they are often described as Southern rock, they aren’t so easily pigeonholed as some of their music could be better described as country-rock, while other songs contain gospel or other influences – they’ve chosen not to stick to a rigid genre but to simply take whatever elements they think will sound good in their music. The results are a fantastic album. It’s almost got a “best of” feel as if you were to listen to the different albums they’ve released over the years, this feels like they’ve taken the essence of each and polished it to make it even better and put it in this album. It’s a nice nod to their past while still making a fresh new album. One stand-out track is “I’ll keep Ramblin’ ” which takes a break from Southern rock midway through and gives us a bit of gospel instead – unexpected but brilliantly done. This is a great album – it’s not their heaviest but it’s a perfect introduction to the band if you haven’t listened to Blackberry smoke before. Existing fans are likely to love this album. Well worth checking out.